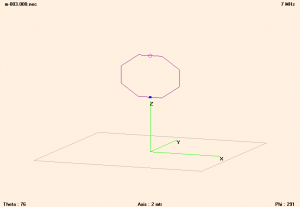 The first series of NEC-4 models explores the behaviour of the main loop at varying heights over ‘average’ ground (not to imply that Paul’s ground type is ‘average’). The models have the tuning capacitor on the low side of the loop (like Paul’s) and are fed directly on the top side of the loop. 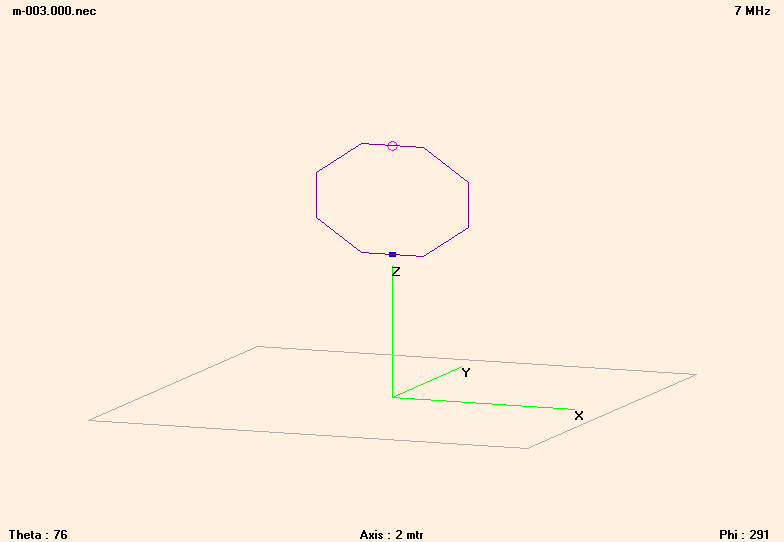 Above, the geometry of the loop in this case at 3m centre height. 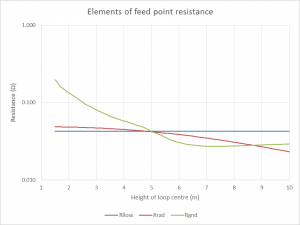 The total feed point resistance Rt at 3m height is given by the NEC-4 model directly as 0.170Ω. NEC-4 also calculates the total structure losses, in this case copper loss in the main loop tube and loss in the tuning capacitor assumed to have a Q of 5000. Rloss=0.038Ω, 85% is in the assumed capacitor loss which might suggest the 3″ tube is an overkill but remember that the capacitor loss is but a guess. NEC-4 also reports the average gain summed over the hemisphere (in this case the models used 1° steps). 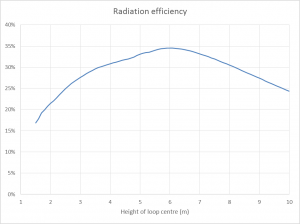 Adjusting this to the whole sphere, we can calculate the portion of Rt that gives rise to radiation, the radiation resistance Rr and in this case average gain (or radiation efficiency) is 28%, and Rr calculated as 0.048Ω. This sense of meaning of radiation resistance is that resistance which gives rise to ‘true’ radiation, RF power in the far radiation field where inverse square law applies, it does not capture energy in evanescent modes closer to the antenna structure. 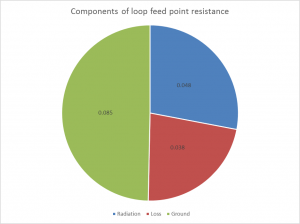 Ground resistance Rgnd is used to explain the input power that is not turned into heat in structure losses and that is not radiated, it is lost by way of loss in the soil which is a lossy dielectric which can be thought of as reflecting downward directed rays, albeit with some loss. A series of models at centre heights from 1.5m to 10m was used to explore the complex interaction of these components. 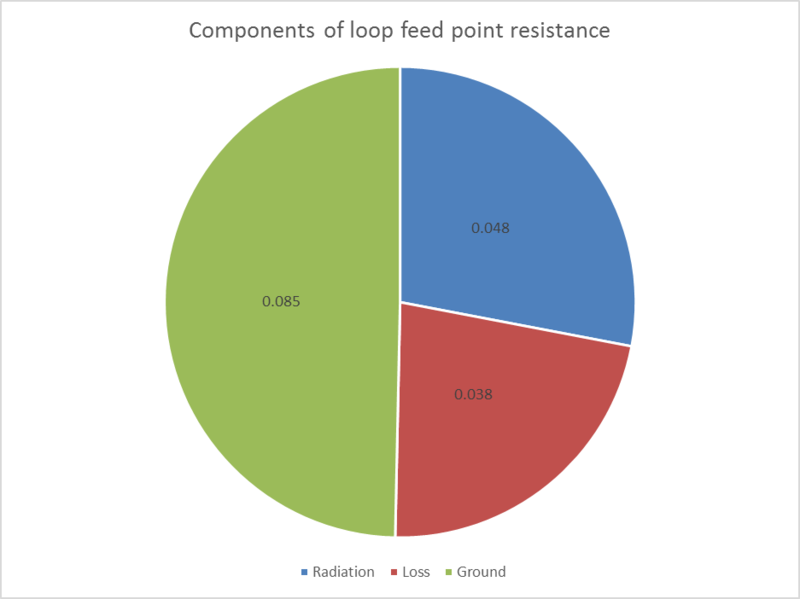 Above, a plot of the three components of feed point resistance. 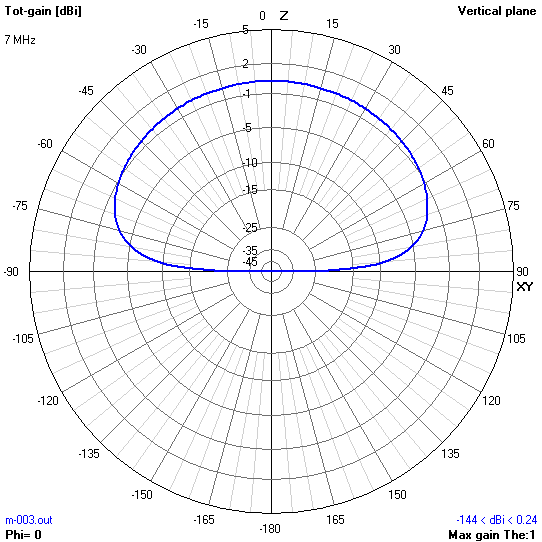 Note that Rgnd falls quite rapidly as the antenna is raised above ground. That is quite understandable and expected. If you wanted to heat the soil by induction fields and near field radiation, you would put the antenna structure as close to the soil as possible. 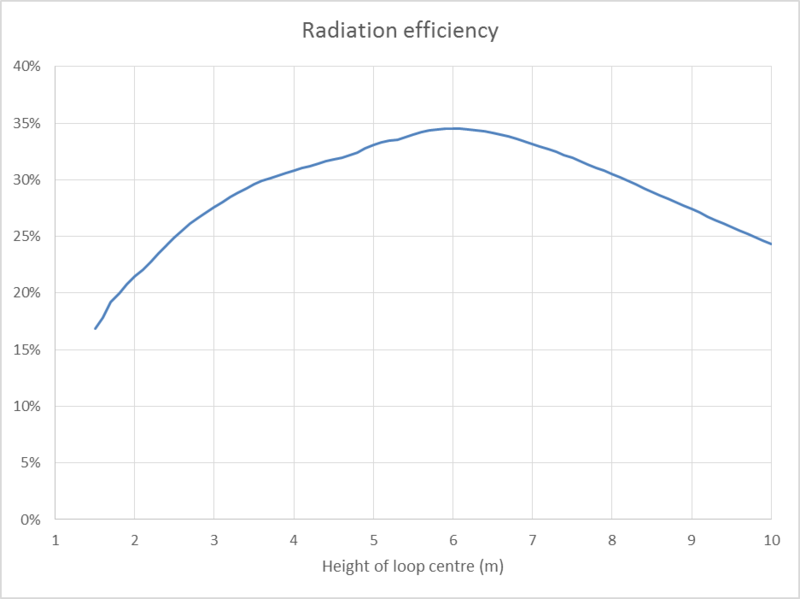 Above, a plot of radiation efficiency. At low mounting heights, radiation efficiency improves to a local maximum at about 6m centre height. Note that no practical 7MHz antenna system in proximity of real ground comes close to 100% efficiency. At low height, the pattern will alway have maximum gain at the zenith as above at 3m. 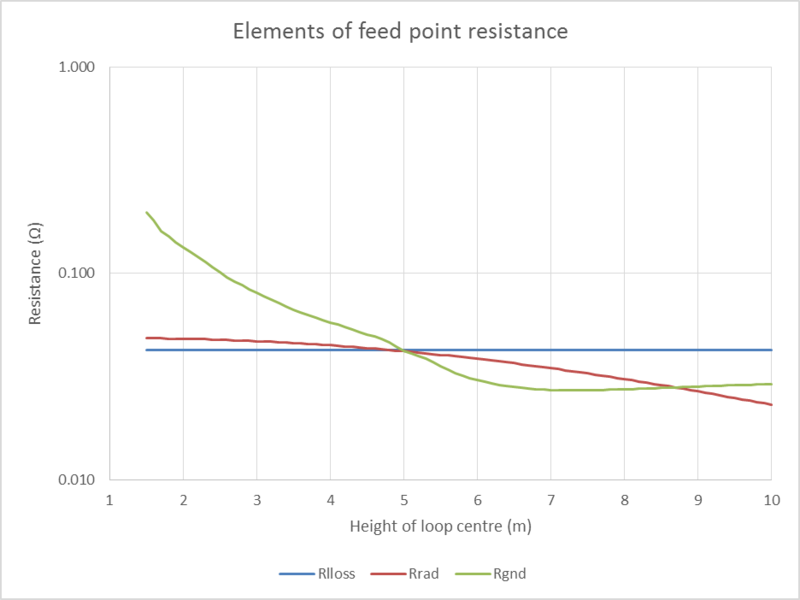 The variation of feed point R implies a variation in half power bandwidth of the antenna as plotted above. 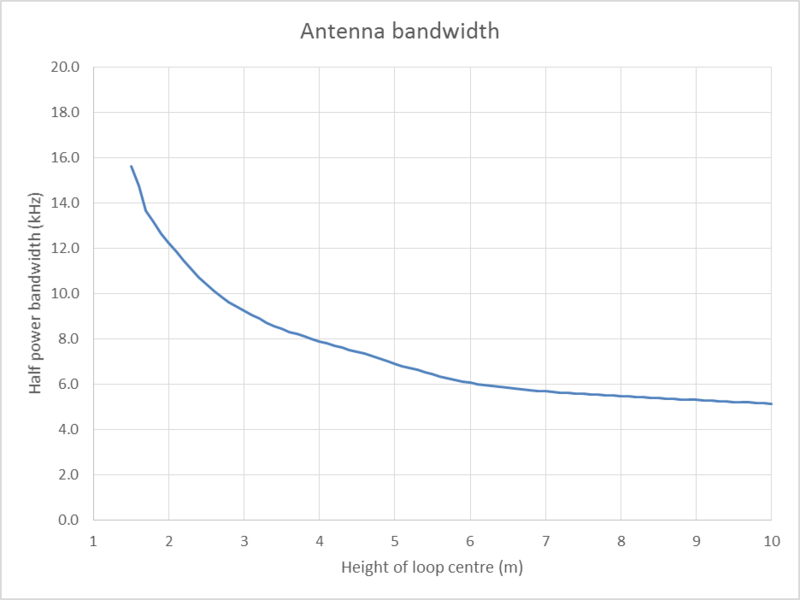 We might expect that the energy stored in the antenna structure is fairly independent of height (the NEC-4 models confirm this at practical heights), and that variations in observed bandwidth are due to variation in Rt. 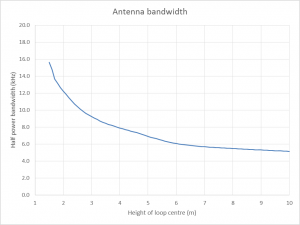 The half power bandwidth is easily measured (bandwidth for VSWR=2.62 for a matched antenna) and provides a simple method of reconciling / calibrating models to a real antenna. 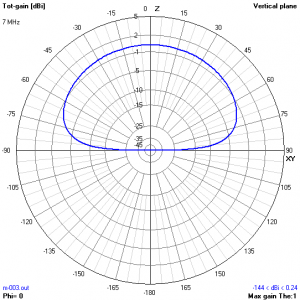 Bandwidth of this model at 3m height is 9.2kHz, Q is therefore 761.